Order Totals over $200.00 Ships For Free! We ship UPS and USPS so please include a mailing and physical address if they are different so there are no delays in shipping your items. If you need a Next Day shipping service call us for shipping options and quotes. 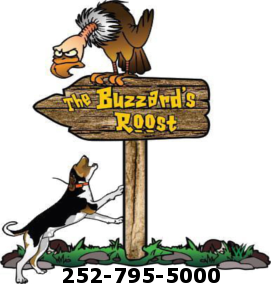 Please email us at sales@thebuzzzardsroost.com before buying. Due to most of our items having Free Shipping this does not include purchases to be shipped out of the US. Email us for proper shipping cost. Returns are to be made with 15 days of purchase date on all items other than K-Light or ProLite which carries a 30 day return policy. No special order items such as tracking collars or custom antennas will be eligible for returns. Items must be in the original packaging. If items are not returned in new condition or if packaging is missing you will be charged a 25% restocking fee, no exceptions. For items like shock collar systems that may come in sealed packaging these may no be returned if opened. A refund will be issued upon the item(s) being returned less the original shipping cost, and restocking fee if applicable, no exceptions.